The Ventair Spyda ceiling fan with light has a 49″ (124cm) blade span and features the latest technology which produces minimal noise. The Spyda offers durable corrosion proof and UV protected components to allow it to be safely used for indoor and undercover outdoor applications. An ECO switch also allows this fan to run at a reduced running cost for further energy efficiency. The Spyda ceiling fan comes with an LED light included (select your preferred light temperature below) as well as a wall control (remote control adaptable). This particular model of the Spyda ceiling fan by Ventair comes with a Titanium finish on the motor and blades. Why Choose the Spyda Ceiling Fan? The Ventair Spyda ceiling fan features corrosion proof components and UV protection allowing the Spyda to be used both indoors and undercover outdoor locations. Its precision moulded PC composite blades are designed for superior balanced performance and low noise output making it an ideal ceiling fan for bedrooms. Furthermore, the Spyda includes an ECO switch setting which is a pre-selected speed setting that allows the fan to run at a reduced running cost whilst maintaining adequate air circulation. This Spyda ceiling fan is packaged with a 20w LED light (select either a natural white or warm white light temperature) and has a titanium finish motor and blades. The light kit is dimmable via the wall control or with the remote control with the dimming function listed below as an accessory. 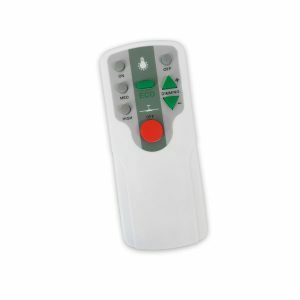 To dim via the wall control flick it off then on for the light to move a step down (up to 4 steps) or via the remote which can be purchased as an accessory. Available in different colours, also without light – please see alternative listing. Maximum angle ceiling installation is 25 degrees.